NEW YORK (CNNMoney) -- When Groupon filed in early June to go public, the daily deals company drew a barrage of criticism for its reliance on an unorthodox accounting practice that masked some of its losses. Bowing to the critics, Groupon amended its IPO filing on Wednesday to strip out the odd metric. Groupon's initial IPO filing highlighted a nonstandard metric called "adjusted consolidated segment operating income." The unwieldy "ACSOI" stripped out Groupon's steep costs for marketing and acquiring new subscribers -- and it made a big difference in the numbers. In Groupon's original filing, its ACSOI accounting showed operating income of $60.6 million for all of 2010 and $81.6 million for the first quarter of 2011. Numbers in an updated filing Wednesday, which removed ACSOI and instead used only standard accounting procedures, were quite different. On that basis, Groupon incurred a $420 million operating loss for 2010 and a $117.1 million loss in the first quarter. Groupon CEO Andrew Mason defended the use of ACSOI in the updated filing, even though the company removed it from its metrics. "We exclude those costs because, unlike our other marketing expenses, they are an up-front investment to acquire new subscribers that we expect to end when this period of rapid expansion in our subscriber base concludes," Mason wrote. "While we track this management metric internally to gauge our performance, we encourage you to base your investment decision on whatever metrics make you comfortable," he added. Still unprofitable in the second quarter: Groupon's filing Wednesday also revealed its financial results for its second quarter, which ended June 30. 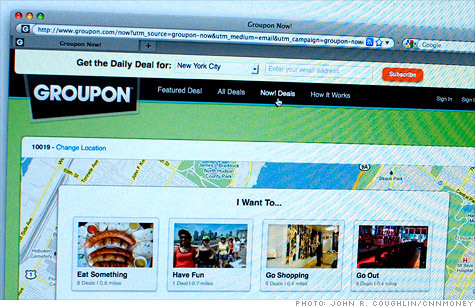 Groupon's sales came in at a record $878 million, but it lost $102.7 million. The revenue Groupon reports reflects the face value of the coupons it has sold. However, a portion of that cash gets passed on to the merchants. Groupon's "gross profit," the revenue it keeps after making those payouts, was $341 million for the quarter and $611 million for the first six months of the year. Groupon's subscriber count -- the one Mason says it is spending aggressively to beef up -- now stands at 116 million, up from 83 million at the end of last quarter. Among those subscribers, 23 million have purchased a Groupon at least once. Groupon has never turned a profit, but investors seem to be shrugging off the red ink from tech startups' IPOs this year. LinkedIn's (LNKD) shares more than doubled in its May IPO, even though the company turned only slight profits in 2010 and 2006, and has otherwise has been in the red every year since its 2003 inception. The stock is still trading well above its IPO price, giving LinkedIn an $8 billion valuation. Shares of Fusion-io (FIO), which makes storage systems for data-heavy tech companies, surged 18% in their public debut -- though the company lost almost $32 million in its last fiscal year. Pandora (P) shares also fared well, even though the unprofitable company expects to continue losing money "through at least fiscal 2012."